PT Tech's new CDB1924A replaces 19" drum brakes and conforms to the new AIST brake standard. If the installation conforms to AIST's dimensional standard for DC mill motors, then when ordering all that is required is the DC mill motor number and existing electrical coil specifications. In all other installations, please provide a drawing of the existing brake drum. 24" inch disc replaces an 19" drum. PT Tech supports its commitment to excellent field service with a large inventory of parts and a 24-hour emergency service. When Converting The CDBA directly replaces an 19" drum brake. It has the same mounting footprint and torque capacity as an 19" drum brake. When converting, it is critical that the disc's centerline is in the same position as the drum's centerline. 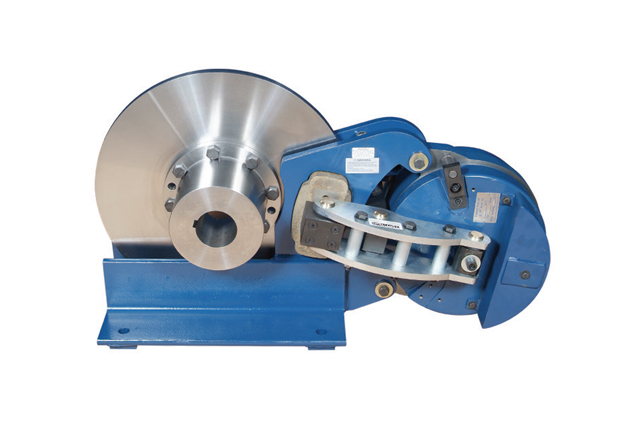 Single-acting caliper disc brakes impose a bending moment. Shafting should be reviewed prior to installation. Consult PT Tech. In most cases, PT Tech can suggest mounting adaptations for non-standard drum brakes.